The legendary city of Stalingrad was always a weapons town. Its heir, Volgograd, is still a large military industrial center. In the 1990s it participated in the creation of the intercontinental Topol missile and the Iskander ballistic missile system, and today the enterprise's workshops are producing the new Russian Yars intercontinental ballistic missile. 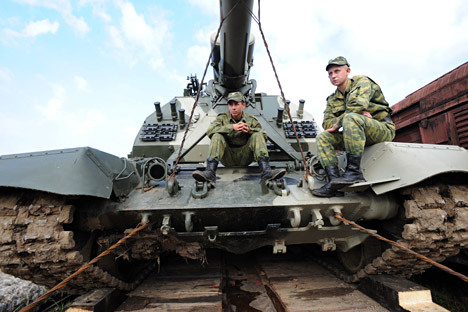 As World War I approached, Russia desperately lacked modern weapons for its field army. The industry developed quickly, but this pace was not enough for an enormous country with more than a million servicemen, whose number could increase tenfold in the event of a war. Right before the declaration of war in 1914 the government decided to build an artillery factory in the Volga town of Tsaritsyn that would be responsible for new production: armored trains, railcars, etc. These armaments became very handy in the next war, the Russian Civil War, which saw hostilities taking place all across the country, from European Russia to the Far East. There was basically no frontline and maneuverable units, in particular those with armored trains, could easily operate in the enemy's rear. In the center of the major battles, Tsaritsyn was the city where weapons were repaired and trains were covered with armor. After the town was renamed Stalingrad the weapons factory was named Barricade and subsequently began a large-scale modernization program of the Soviet artillery. The factory's management received prestigious government awards on many occasions, yet this did not protect the plant from Stalinist repression. On the eve of the Nazi invasion of the USSR a design office was established at the Barricade factory. It launched a particularly important project: the development of heavy-duty weapons with more than 200- and 300-mm caliber. By the beginning of the war the project was not finished and the factory's main products during the war years were the 76-mm canons and mortars. The factory's engineers were evacuated and as the Germans advanced the design office workers and deputy director took up arms. Fewer than half of them survived. In 1943, on the ruins of the destroyed enterprise, the survivors began restoring production, demonstrating miraculous heroism. In just a year the factory, literally having risen from its own ashes, was already building 122-mm weapons for heavy Soviet tanks. In the immediate post-war period Stalingrad residents continued producing cannons for the army, including completely modern ones destined for coastal defense. The factory also excelled in the production of civilian apparatus, such as drilling rigs. By the end of the 1950s the factory received a new profile: missile construction. The missile flew farther than the shell and had a more powerful combat component, on which a nuclear warhead could be placed. The city, now-renamed Volgograd, started producing the Luna unguided missile, whose models the Soviet Union sent to Cuba in 1962, the Temp guided missile and the entirely unique and incomparable Tochka and Oka missiles. In the 1980s the city began producing the Topol intercontinental ballistic missile. But no one had forgotten about the artillery. The Barricade design office produced weapons for the Pion self-propelled units, the self-propelled Malka and the Msta howitzers. In view of the office's potential, in 1990 it was separated from the factory and received its own name: the Titan Design Office. In the 1990s Titan participated in the construction of the Topol intercontinental missile and the new Iskander ballistic missile system. In 2009 the enterprise began building the new Yars intercontinental ballistic missile. Once just a part of the renowned factory, the design office finally eclipsed its fame. Since 2014 both the factory and the design office have officially been called Titan.